Serve up your next pizza Santa Fe style. 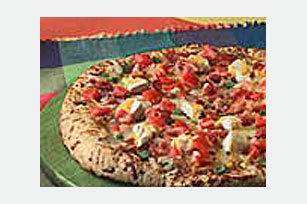 Top a ready-to-use baked crust with chicken, bacon, chopped tomatos and plenty of shredded cheese. Brush pizza crust with oil; top with remaining ingredients. Place directly on oven rack. Bake 5 to 8 min. or until cheese is melted. Prepare using KRAFT Mexican Style Finely Shredded Cheddar Pepper Jack Cheese.